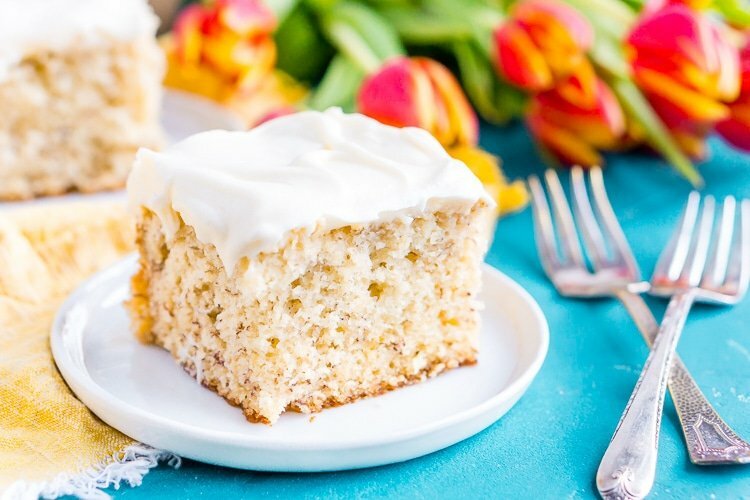 This is the Best Banana Cake recipe EVER! 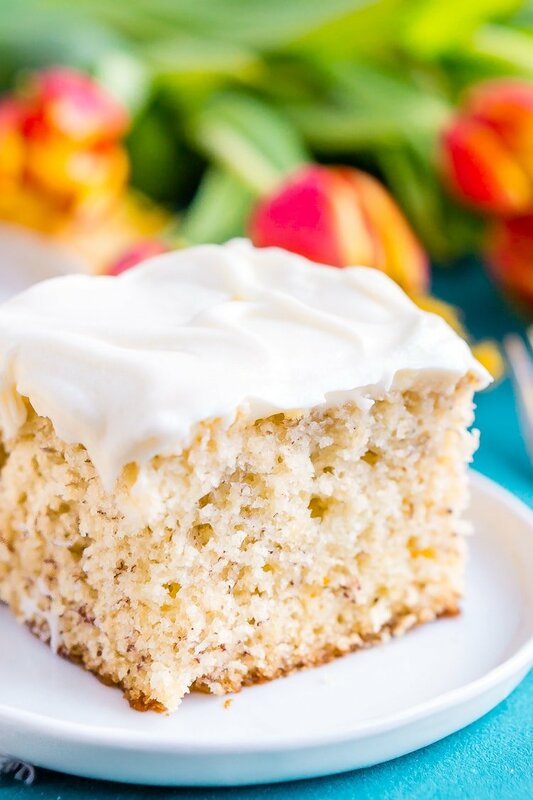 It’s moist and sweet and topped with a tangy cream cheese frosting! I’m excited to share this recipe with you today. Not only is it delicious, but it really is the BEST Banana Cake ever. I have been making this cake for about seven years now. Everyone loves it and always asks me for the recipe. I had some ripe bananas on the counter and rather than making this easy banana bread again I decided a cake sounded better. Cake almost always sounds better! When life gives you ripe bananas…make banana cake. Then, frost it with a cream cheese frosting. SO GOOD!! Buy My Favorite Baking Pan Set Now! 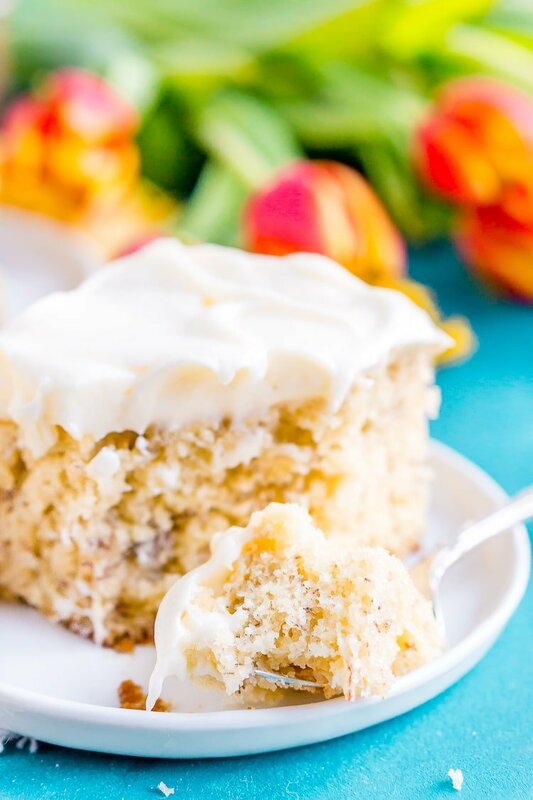 A tangy cream cheese frosting is the best way to frost a banana cake since the two go together so well! You might even crave a piece at 2:00 in the morning when you’re unable to sleep. I had the fridge door open and was eating the cake straight from the pan. My husband asks, “what are you doing?” LOL!! I guess I need to be a bit quieter. Buy My Favorite Hand Mixer Now! I have always followed this recipe as is since it was given to me. However, sometimes I have had to bake it longer than an hour depending on the pan I’m using, use a dark non-stick pan for best results. Also, this recipe requires the cake to be placed in the freezer immediately from the oven. Make sure you’re using a pan that will not crack and have adequate space in the freezer. The next time you have brown bananas sitting on your counter, do yourself a favor and make this banana cake ASAP! It’s addictive and delicious and is sure to hit the spot! Buy My Favorite Liquid Measuring Cups Now! Pin this Cake Recipe for Later! Watch How to Make this Banana Cake in the Video Below! This is the BEST Banana Cake! 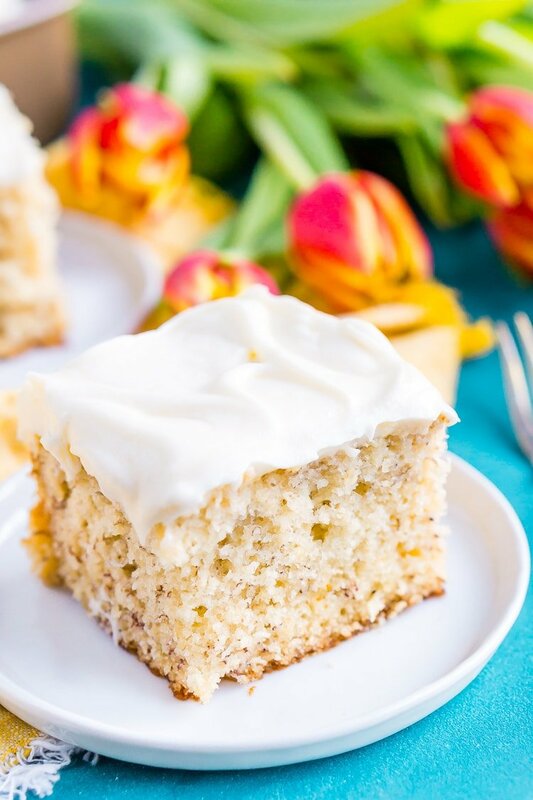 It's moist and sweet and topped with a tangy cream cheese frosting! Grease and flour a 9x13-inch metal cake pan. On a dinner plate place the peeled bananas and use a fork to mash them. Then place bananas in a bowl and pour lemon juice on top; set aside. In a medium bowl, mix flour, baking soda, and salt; set aside. In a large bowl, cream 3/4 cup butter and 2 cups plus 2 tablespoons of sugar until light and fluffy. Then stir in 2 teaspoons of vanilla. Pour batter into prepared pan and bake in preheated oven for one hour or until a toothpick inserted in center comes out clean. Add powdered sugar and heavy cream and beat on low speed until combined, then on high speed until frosting is smooth. Such a yummy cake Rebecca! This sounds so yummy! Thanks for sharing on Found & Foraged! Oh I’m in love! I haven’t had a banana cake in forever, and almost forgot they existed! Thank you so much for sharing on Weekend bites! I’ll be trying this one soon. Is the baking temperature correct? Is 275 degrees too low? Should it be 375degrees? Would like to try this recipe but hesitate because of the temperature. I can see why the low temperature would make you think twice, but it is, in fact, the correct temp to bake the cake at. Enjoy! I don’t know what I did wrong, that cake took almost 1 1/2 hrs to bake on 275• it was nice and full and the last minutes it sank! Was disappointed, it was heavy and very wet and the 1/4 top looked uncooked. Hi Lucete, I’m sorry to hear the cake didn’t turn out for you, I’ve made it often and have never had it sink in the center. Did you check the cake with a toothpick or tester when it first came out of the oven and was it clean? I’m guessing not if it was wet in the end. Did you measure the bananas into 1 1/2 cups, the usually equals about 4 medium bananas, but bananas vary in size and should always be measured with a cup. 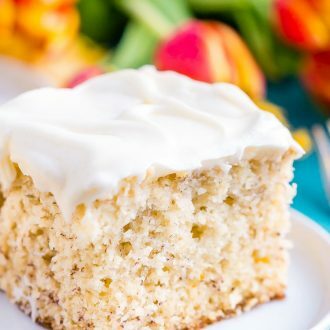 This recipe makes the best banana cake ever! Super tender and moist. I am making one today and will add raisins. Can’t wait to get a piece. I’m so glad you enjoyed it! Raisins sounds like a delicious add-in, I will have to try it! My husband and I love raisins in baked goods. I rolled the raisins around in flour and dusted the excess off. Then, I stirred them gently into the batter so they would not sink. PERFECT! !